In July of 2004 I was a very healthy, fresh out of college, in my 1st apartment and my 1st real job and I got health insurance. I had one health issue, just one. A swollen prostate. I was put on an antibiotic and lost everything I had and myself. Here are the events that took place in chronological order. Having new insurance I went for a physical and my doctor said my prostate seemed a bit tender and I should see a urologist. I scheduled an appt with a urologist in August of 2004. At that appointment and exam I was told that I may have bacterial prosititis and I would be put on 3 weeks of Cipro, 500mg a day. Trusting a doctor and not questioning an antibiotic I accepted and went to CVS. I filled my prescription and went home. After a few days of work and preparing to move into my 1st apartment, I started to experience hip, shoulder and leg pain, also headaches, dizzy spells and major fatigue in all parts of my body. I brushed this off thinking it was my physical activities and continued with my week. Taking cipro 2x a day faithfully. Within a week I was experiencing back pain, fatigue, sore arms, muscles crunching and popping in my back, as well as all my joints starting to snap and pop. I still put no connection that this was my antibiotic… I well on my way into a Cipro Adverse Reaction Toxicity.. but I kept on strong and living my life, unaware. Around my 2 month mark I realized that something was happening and I brought it to the attention of my urologist who told me that Cipro could not be causing such affects and the only damage that might happen is to my Achilles tendon. I was then given a 3rdmonths prescription and sent on my way with a follow up a month later. A total of 63 days of cipro I was on by the end. WELL into my cipro treatment came my next appt….. In September of 2004 I was to have a root canal, this was not affordable at the time so I had a tooth pulled and I was to have an oral implant put in via surgery. The surgery was scheduled and it was a quick 1 hour oral implant procedure. After surgery I was being prescribed medications for the surgery by my periodontist and his nurse. I was told that I would be put on an antibiotic to prevent any infections and 10 days of a prednisone packet to strengthen the implant. At that time, I made it very clear that I was on Cipro 500mg for over a month for a prostate issue. This was marked in RED pen on my file. Right underneath is marked the prescription for Prednisone. Already well into a Cipro adverse reaction and damage, then topped with Prednisone (major drug interaction).. YOU DO NOT MIX CIPRO WITH STEROIDS, NSAIDS! Within 2 weeks I was unable to get out of bed, I lost major muscle mass and weight. I went to the ER, I went to doctors, all of this is fully documented from day one in my medical records that I went for HELP, over and over, telling them that I was suffering from a major adverse reaction from the mixture of Cipro and Steroids, and then having put so many other medications into the mix it had finally crashed and destroyed my young body. I was put through every test you can think of. I was also marked as a hypochondriac very quickly as no doctor would believe that an antibiotic could do such things. The damages continued quickly and painfully.. I started to have tearing muscles in my back, burning and tingling nerve sensations in patches on my back, and arms. The snapping and grinding of each joint, in my arms, legs, shoulders and spine were becoming constant and hurtful. Until this day I have not healed, I have ruined muscles, nerve, cartilage, chronic full body and spine pain, unbelievable fatigue. But I live. I will not surrender to it. I live. While sitting at my grandparents one day, I felt a rib POP near my sternum. I touched my chest and I felt my rib cage clicking back and forth. I immediately went to the ER and they could not explain how it could have snapped. I went to my hospital and I was questioned about my medications. I told them that Cipro caused cartilage destruction in weight bearing joints and muscles. They said this could not be the cause at all, it had to be something else. I told them I had been swimming the week before and that was about it.. during physical exercise for my sore body. This was written down as the possible cause and my honesty about the cipro ruining my joints and such was brushed off.. This was now the medical reason to have part of my ribs removed in a one hour surgery. There was no swimming accident. I started to write to the FDA, To Bayer, To Lawyers, To anyone that might listen, only to be shot down and told that there was no way that anyone would go against a pharmaceutical company and that yes, I was a victim of medical malpractice, and yes my doctors believed me as they knew me before hand, but it was not in the medical journals and that if I had printed the 50 paged warnings of Cipro, rather than relying what the bottle said “do not drink or operate machinery”. I have lost everything, my college degree earned teaching job, my healthy body, my home, my partner, the friendships and family that cant help. For years I have emailed, mailed, talked, tried to get help. I have been in touch with 100s of victims, belong to support groups, 100s of other people my age, younger, older, all in the same position as I am.. a very damaged body, a victim, ignored and left to suffer with the consequences. I was perfectly healthy and happy before this medication. I had a life in order and I was ready to begin it and within weeks I lost it all. I trustingly took these medications from my doctor with the hope to fix my prostate. Over the past 6 years I have gone into financial disgrace, I’ve had to move home with my family off and on as I lose work due to my health and body and I am in chronic full body pain and damages that no physical therapy and major medical visits are not repairing. I am so afraid of future, if I hurt this much at a young age I cannot imagine the pain as I age. For my own sake and proof, from day ONE I kept a journal of every test, every pill, every exam I was put through. I also paid to have every medical record, dental record, doctors not, prescription, xrays, you name it… copied. I have a binder that shows a 25 year old healthy person in 2004 and then after that over 500 pages of medical records, exams and physical issues. The proof is as clear as day, in time line order. This has not been good enough for anyone I’ve spoken too. Sadly, the other victims, who have just as long as a list as I do, suffer from the same ignorance from the medical and lawyer field. What is dis-concerning in the end is that my Primary Care Doctor, My Rheumatologist, My Physical Therapist and many other doctors believe what happened to patients.. but they are not willing to take the stand or point out that these medical adverse reactions are not in their medical journals and that they are ill-informed of these events. I’ve been told that the pharmaceutical companies also keep this from their doctors when selling the item. Like many of the victims, our doctors knew us before we took this drug when we were healthy people who happened to end up with a UTI or Prostate Infection that was mass dosed by Cipro or Levaquin.. only to have it ruin us fully. My medical life is taking over. My body has not healed at all, it has become worse. The FDA knows the power of cipro, all the people taking it via Anthrax were damaged so bad it ended with a major law suit. The sister drug Levaquin is in the middle of major law suits due to the same damages… In 2008 the FDA black boxed Cipro due to its physical damages on humans. I have no idea what to do with my life. On my right side I am damaged permanently and cannot work or collect disability. On my left side I have 85,000 in student loans that are ruining me financially into bankruptcy (which I cannot file as I have nothing to file for other than my student loans). I need help. There has to be a class action law suit for myself and the victims. We all have our medical records, we all have proof, we all have rights. Search: Cipro, Steroids, Fibromyalgia, Tendon Rupture, Muscle Wasting, Fluorquinlione support groups and toxicity.. you will see for yourself. As for the power of facebook there are 2 Fluoquinolone groups with peoples photos and stories. In just a facebook victim group (mind you, not all victims know of this group or have facebook).. there are 764 people.. growing everyday. Thats almost 800 letters sent just from one small support group to FDA and BAYER to no reply or help. pharmacy was floxed and recovered. Floxies are everywhere. Those of us who took only a few pills without steroids or NSAID’s usually can recover, but only after months, if not years of pain, and 100% healing of all damage is rare. This is crazy and has got to stop. First of all I’m so sorry to hear this happened to you and like many I know where you are coming from. I was affected almost three years ago by taking just two pills. My life went into a tailspin. I had a 22 month old daughter at the time. I had to take her with me to stay with family because I couldn’t take care of day to day life. I will tell you that now I am feeling much better. It’s been a long road and while I will not call myself recovered I will say that I am living with the effects and living my life. So I do want to offer that hope. While I was reading your story I was struck with the instinct to suggest something to you that I don’t always offer up to people recovering because it is something that isn’t always possible and it is somewhat expensive. However it was integral to my recovery process. For about six months after I did nothing physical. I think I was in a protective mode and afraid to do anything that might cause further stress or injury on my body. For some reason, I’m not really sure why (maybe a friend mentioned it or I saw an ad?) I decided to try Bikram yoga. If you don’t know what it is look it up. The first two months of practice were agony for me. My legs felt like lead weights at the end of every class. I would shake from head to foot some days. But there was something about going into that room on a regular basis and just sweating, sweating, sweating and stretching, stretching, stretching. Sometimes I would just lay on the mat for the 90 minutes and not do any of the poses if I felt too weak. They say the only goal, though, is to stay in the room the entire 90 minutes. It is intense. I won’t say it isn’t. But for me it gave me back the feeling of being strong which Avelox had taken away from me. It took about a year for me to be able to get through all 26 poses without having to stop but it was worth all the work. Again I know it isn’t for everyone but I also know that when we are in the throws of the illness we will be open to possibilities for feeling better. I just wanted to throw it your way in case it’s something that interests you. Good luck. If you want more information related to this please don’t hesitate to ask. Heat increases circulation, which helps the body rid itself of water-soluble toxins. This can be achieved by a sauna as well. Wow! I had an adverse reaction after only 3 pills of Cipro. My meniscus spontaneously tore. My calves atrophied. I pulled my medical records and somehow I had tolerated higher floxings & larger doses over the years; however this time that wasn’t the case. I hope someday there’s a way to rebuild and restrengthen the tissues. I’m now on a mission to avoid antibiotics if at all possible. Hello Chris. I am so sorry to hear of your story and struggles. I have had persistent lyme for many years, and so I am still trying to recover from aggressive antibiotic therapy. In fact, my gut became so depleted that I developed multiple episodes of bacterial food poisoning and so was prescribed Cipro multiple times. My knees will never be the same and I deal with some level of pain in these tendons every day. And so I had to turn away from traditional medicine to find a way to heal myself. Through my own research I found many alternative therapies to bring my body back from the edge. I ended up writing a book about it, The Youth Prescription, on Amazon. I feel for you. If you would like to have a free copy, please send a message to LauraGeisselReads on facebook. I’ll let you know when it comes up as a free download on Amazon. I have lupus and fibro. This is the first time I’m hearing about the damages from cipro. But I want to mention to you a tip from an epileptic friend. Student loans may be able to be dismissed if you are permanently disabled. I thought it was too good to be true, but when a bill collector called after I heard this info, I told him I’m disabled, have no income and call me whenever I finally get my disability approved. All of a sudden, he got nice. A bill collector being nice! I was shocked. And he asked if it was permanent and if a dr would verify it. Yes and yes, but I don’t have disability yet. Didn’t matter. He sent me the forms and I had my dr fill in the very brief questions. I am awaiting results soon. Its worth a try! Oh Chris…this is all too familiar. Doctors denying that it could possibly be their wonderful Cipro. They LOVE it because it kills everything…but interestingly the same brain that got them through med school can’t figure out that means it also kills the GOOD stuff too, like microbiomes, collagen, bone, muscle, etc. I too was given prednisone and was not warned. I tried to find an attorney–went through dozens of them and a few seemed interested in my case, but declined because the laws in CA make it prohibitive to do a med mal case unless it is extreme. I filed it myself, which was daunting, but I, like you, am completely broke because of this and I’ll be damned if I am going to give up without a fight. 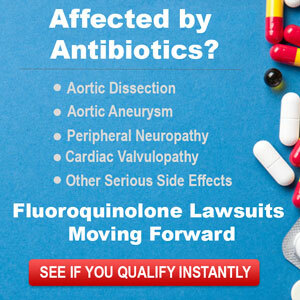 I am suing both the doctor and the pharmacy for not warning me. (FYI in CA —and maybe other states, pharmacies are REQUIRED to give a new drug consult. THis is not something that can be checked off in that little box. The pharmacist has to initiate the consult, and only then can it be declined.) I think if enough doctors and pharmacies started getting sued maybe THEY would put pressure on the drug companies, or just stop using these poisons. And that black box, which unfortunately ONLY applies to ruptured tendons, was not even thanks to the FDA, but to a group called Public Citizen who waged a long hard fight to get it put on. I also wanted to mention, that it is just as well you did NOT have the root canal. I have had three in the past and after paying $1000 cash each, I lose each one within a year. But as it turns out now, roots canals are really unhealthy for you. Leaving the death tooth in your mouth creates all sorts of health issues, so good you don’t have that, especially now. Not sure what you have done so far, but if you haven’t yet, I would suggest finding a good ND or integrative doctor who does nutrient IVs. Wishing you recovery.